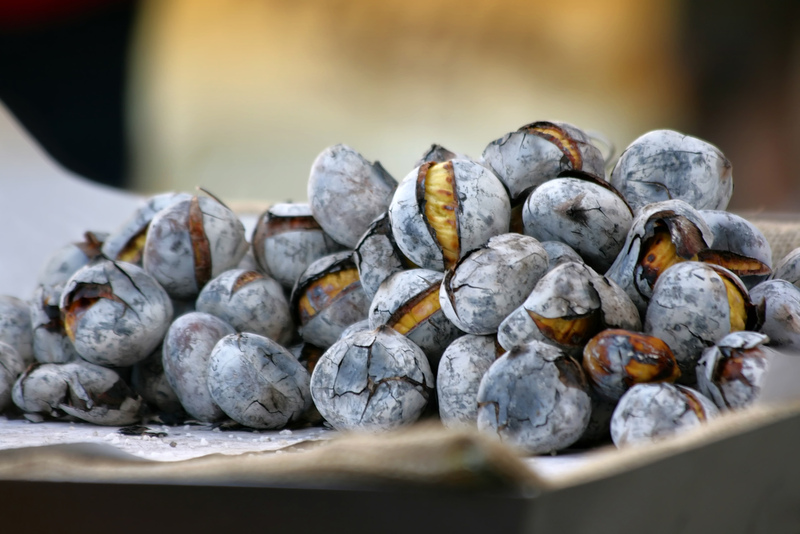 Roasted Chestnuts, or Castanhas Assadas, are a Portuguese classic. Most typically roasted on open flames, castanhas assadas are a very typical food to eat in Portuguese cuisine, especially during the São Martinho festival celebrations. They are the perfect amount of soft, sweet, and savory. They are a super simple and easy to make snack that is always a great comfort food to share with guests. If you do not have an open flame to grill the chestnuts on, you may also use an oven. 1) Preheat the oven to 345 degrees Fahrenheit. 2) Wash the chestnuts in water. 3) Make a horizontal cut on the side of each chestnut. 4) Place the chestnuts on a baking tray and sprinkle with the water and the salt to taste. 5) Roast the chestnuts for about 30-35 minutes in the oven until they are browned but not overcooked and soft on the inside. You must find a healthy medium to make sure they are not too soft and not too cooked as it makes all the difference. 6) Once they are done, serve while hot. Once done, store them inside a newspapper or a towel. The damp will make then softer and easier to peel off.